Asteroid #9 Metis was discovered by A. Graham. J. Palisa discovered asteroids #291 Alice and #292 Ludovica. Born, Wolfgang Ernst Pauli, physicist (quantum mechanics, spin, relativity), Nobel 1945 "for the discovery of the Exclusion Principle, also called the Pauli Principle"
J. H. Metcalf discovered asteroid #599 Luisa. E. L. Johnson discovered asteroid #1922 Zulu. Bell Labs demonstrated the first practical silicon solar cell. Robert Noyce was granted the first patent for an integrated circuit. Subsequent development of the technology became crucial in making advances in many fields, including the capabilities which could be launched in spacecraft. 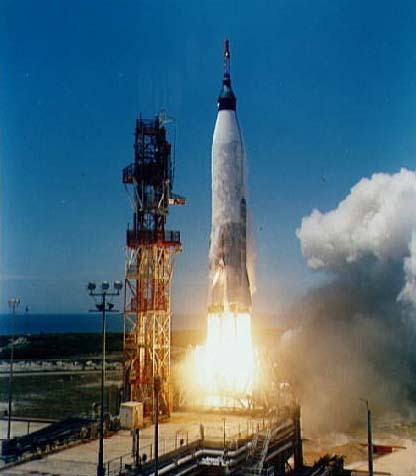 NASA launched Mercury Atlas 3 as an unmanned orbital test of the Mercury capsule, but the mission had to be aborted when the booster failed to follow the correct trajectory. Mercury Atlas 3 (MA-3), launched 25 April 1961, was to be a one-pass orbital flight test of the Mercury capsule, with evaluation of all systems, network, and recovery forces. The capsule contained a mechanical astronaut. After lift-off, the launch vehicle failed to roll to a 70 degree heading and to pitch over into the proper trajectory. The abort-sensing system activated the escape rockets prior to the launch vehicle's destruction by the range safety officer, appoximately 40 seconds into the flight. At that time the vehicle had achieved an altitude of about 5 km. The capsule then coasted up to 7 km, deployed its parachutes, and landed in the Atlantic Ocean about 1.8 km north of the launch pad. The capsule was recovered, was found to have incurred only superficial damage. It was subsequently shipped back to the manufacturer for refitting. The refitted capsule was reflown on Mercury Atlas 4. The first Lockheed A-12 became airborne during a high speed taxi test. The A-12 was a preliminary version of the SR-71, the fastest publically known manned airbreathing jet airplane (2018). USSR Soyuz 10 cosmonauts Shatalov, Yeliseyev and Rukavishniko returned to Earth after they were unable to enter the Salyut 1 space station, even though they had docked with the orbiting outpost. Soyuz 10, launched 23 April 1971, was piloted by Commander Shatalov, Flight Engineer Yeliseyev, and Systems Engineer Rukavishnikov. Soyuz 10 was launched into an orbit in the same plane as the unmanned Salyut 1. Orbit corrections to reduce the apogee and perigee of Soyuz 10 to prepare for rendezvous with Salyut took 24 hours. Salyut was maneuvered four times, Soyuz 10 made three principal maneuvers and more orbital adjustments on the basis of instructions from the tracking ship Akademik Sergey Korolov located in the Atlantic. Automatic devices maneuvered Soyuz 10 until the two craft were 180 meters apart. The crew reportedly found the docking manenver extremely nerve-wracking. They were able to see the brightly colored Salyut only with the aid of optical devices when the ships were 15 km apart, and the problems of docking with a large unmanned, non-maneuvering mass were quite different from the joining of two Soyuz, each able to adjust its position. Also, new telemetry systems, new rendezvous systems, and new docking equipment were used. Although the Soyuz physically locked onto the station, the connection was not secure enough to allow the hatches to be opened to allow the cosmonauts to enter. In addition, it appeared the hatch inside the Soyuz was jammed. This led to further complications when the mission was abandoned, as the Soyuz had difficulty detaching from the station. The two ships remained docked for 5.5 hours, in total. After undocking, Soyuz 10 flew around Salyut, and the crew took many photographs. Salyut was described as the first of its kind, with no precursors. Externally mounted TV cameras covered the approach, docking, and separation. The Soyuz retrorockets were fired at the first opportunity after undocking to permit the cosmonauts' return to Earth. Upon re-entry, the capsule became filled with toxic fumes, causing Rukavishnikov to pass out. Fortunately, all three crew members recovered from the ordeal unscathed, and the landing in Karaganda on 25 April 1971, the first pre-dawn landing of a manned spacecraft, was deemed a success. NASA's Apollo 16 mission started its transearth injection maneuver to bring the astronauts home from the fifth Lunar landing mission. N. Chernykh discovered asteroids #2656 Evenkia and #3653. E. Bowell discovered asteroids #2688 Halley, #3275 Oberndorfer and #3692. Pioneer 10 became the first spacecraft launched from Earth to cross the orbit of Pluto and become more distant from the Sun than the outermost planet. Clifford D[onald] Simak (3 August 1904 - 25 April 1988) was an American science fiction author (three-time Hugo recipient, including 1964 best novel Way Station). He believed science fiction that is not rooted in scientific fact was responsible for the failure of the genre to be taken seriously, stating his aim was to make the genre a part of what he called "realistic fiction." One idea often found in his stories is that there is no past for a time traveler to go to. Instead, our world moves along in a stream of time, and to move to a different point in time is to move to another world altogether. 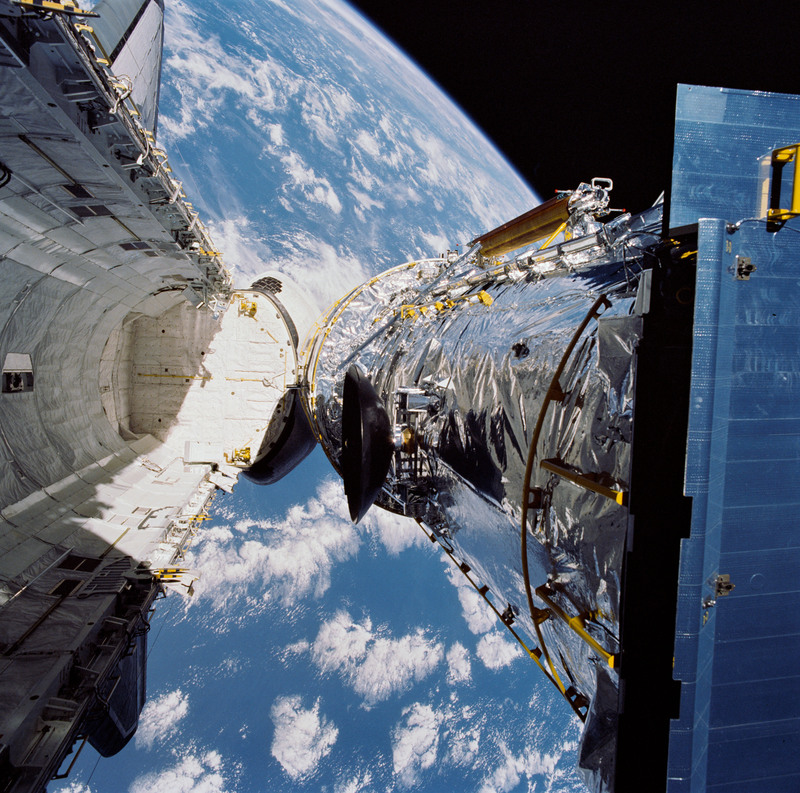 NASA STS 31 astronauts deployed the Hubble Space Telescope into Earth orbit from the space shuttle Discovery.